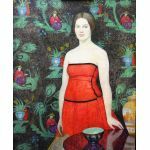 (New York, New York, 1887 - 1974) Born in Vienna, Austria and raised in New York City where she remained based for her lifetime, Emma Fordyce MacRae is included in this exhibition as a result of her membership in and connection to The Philadelphia Ten group. An exhibiting member of the group from 1937 to 1945, MacRae summered in Gloucester, where she made acquaintance with Philadelphia Ten women. She befriended and regularly socialized with M. Elizabeth Price and Lucille Howard in the late 1920s and 1930s. MacRae studied under Impressionist Robert Reid and at the Art Students League with Kenneth Hayes Miller, Impressionist Frank Vincent DuMond, Symbolist Luis Mora and Ernest Blumenschein. Best known for her paintings of floral compositions set against textures of interior backgrounds, she was also critically praised for her figurative compositions. Her work demonstrated a keen decorative sensibility. Her paintings often appear dry and chalky as a result of applying her paint sparingly and allowing the texture of the canvas to show through. MacRae exhibited extensively in many of the most prestigious exhibition venues of her time, including the Pennsylvania Academy of the Fine Arts, as well as forty-one times between 1918 and 1950 at the National Academy of Design. In 1951 she was elected as associate member of the National Academy of Design; she was the sole member of The Philadelphia Ten to achieve that great honor. MacRae painted until a few years before her death in 1974. Her later works focused on smaller-scale floral still lifes and cityscapes - especially of Central Park.